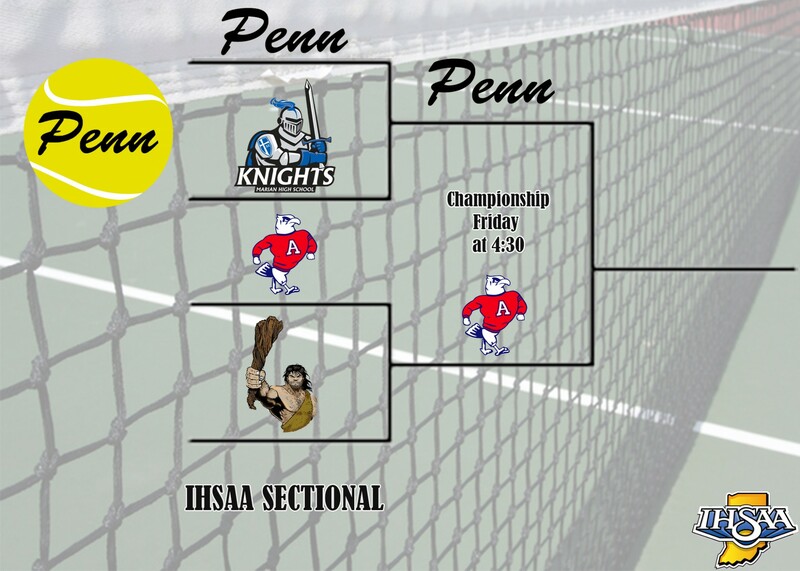 Penn High’s Kingsmen defeated Marian, 5-0, on Thursday, Sept. 29, in the first round of the IHSAA Sectional at Penn. Coach Eric Bowers’ Kingsmen will seek their 15th consecutive sectional championship in Boys Tennis on Friday at 4:30 p.m. against South Bend Adams. A.J. Antonelli (Penn) beat Cameron Rafinski (Marian) 6-1, 6-2. Owen Kleppe (Penn) beat Evan Kovatch (Marian) 6-2, 0-6, 7-5. Sid Das (Penn) beat Joshua Bussan (Memorial) 6-0, 6-3. Mason Lee/Cole Pollyea (Penn) beat Michael Gray/Dominik Rafinski (Marian), 6-0, 6-1. Eric Spaargaren/Jack Spalding (Penn) beat Kenny Klimek/Michael Deranek (Marian), 6-1, 6-1.